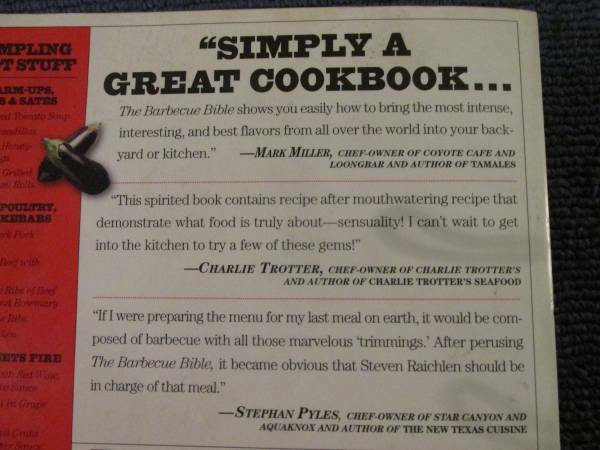 The BBQ Bible: Like New 500-Recipe BBQ Book From America's award-winning master griller Steven Raichlen, the perfect BBQ Master!!! This book got everything: How to grill the perfect T-bone. Succulent chicken from around the world: Jamaica, Senegal, Brazil, India, Thailand, Uruguay. A perfect meeting of fire and ice: Fire-Roasted Banana Splits. Includes FAQs, problem-solving tips, and comprehensive notes on equipment, ingredients, marinades, rubs--even a chapter on thirst-quenchers to serve while you're busy fanning the coals. This book unlocks the secrets of live-fire cooking...with top dishes, the tastiest sauces, and inside techniques and tips. 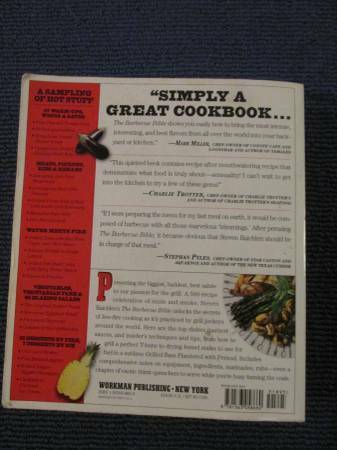 Includes FAQs, problem-solving tips, and comprehensive notes on equipment, ingredients, marinades and rubs. 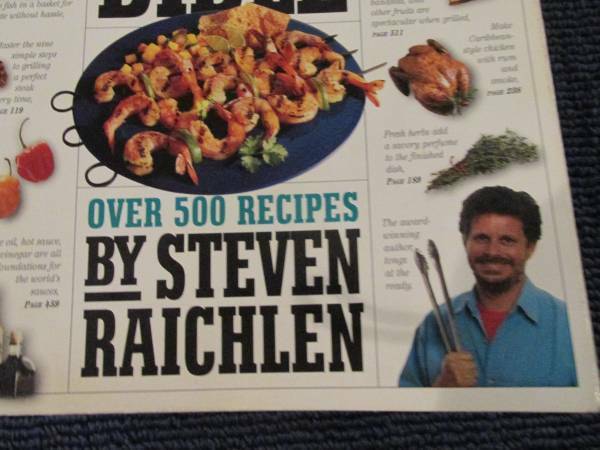 Like New: The BBQ Bible 500-recipe bbq-ing book by Steven Raichien. 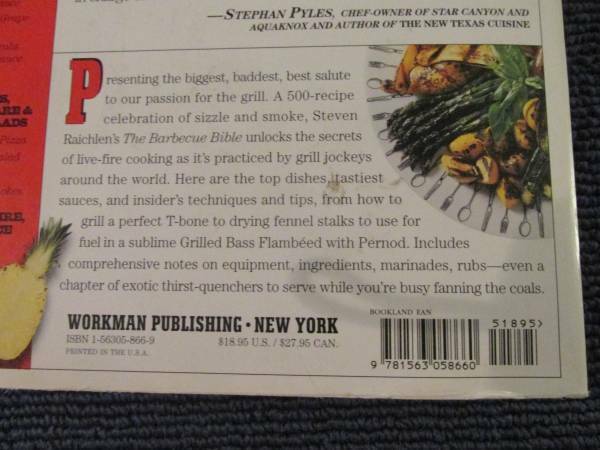 From America's master griller Steven Raichlen award-winning The Barbecue! Bible this is his biggest, baddest, best salute to our passion for barbecue. This book unlocks the secrets of live-fire cooking with top dishes, the tastiest sauces, and insider techniques and tips. 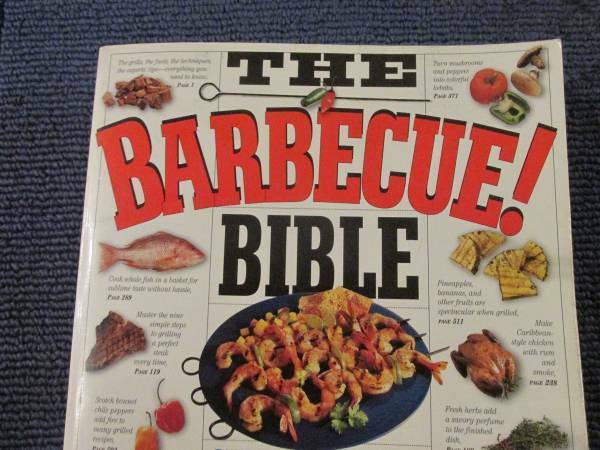 Product Information: This BBQ Bible book is soft cover edition that is published by the Workman Publishing Co., has 556 pages and weights over 3-pounds. The size of this book is; Approximately 9-inches tall x 8-inches wide x 1-1/2 inches thick. Condition: Very nice - No stained or torn pages - Normal wear and tear from 3-years of use but is still in excellent shape. My sister bought me this book for Christmas and I already have one so I'm selling my used book and keeping the one she gave me!! !